Summer is in full swing. The days are hot. The nights are slightly less hot. The smell of vacation is in the air. For some this means going to the beach. For others this means backyard barbecues. For a select few, brave, awesome and stupid, this means trying to outrun a one-ton angry bull. Welcome to Paradise Found Around’s Guide to Running of the Bulls. Man has been running away from wild beasts since the beginning of time. It took the creative geniuses of northern Spain to turn it into a holiday. Later on, it took the creative writings of Ernest Hemingway to bring it to you. Last year we followed the well trodden path of Papa Hemingway and joined the over 2 million visitors to Pamplona to fulfill our destinies of not being killed by a bull. If you decide not to take part because you are too concerned for some odd reason with your personal safety and would rather watch people get gorged then be gorged yourself, that’s ok. You don’t have to run with the bulls in-person to enjoy the fun. Of course there is so much more to the running of the bulls than running with bulls, namely drinking sangria. Lots and lots of sangria – in as cheaply and messily a manner as possible. So don’t make the mistake of being an encierro noob and embarrass yourself in front of the Iruñians.2 What we know as the Running of the Bulls festival, they call San Fermín, a part of which is the running with the bulls, which they call an encierro. But you’re not making the remote trek all the way out to Pamplona to learn Spanish. As far as you’re concerned San Fermín means “running of the bulls”. Another major part, some (not us) might even say the most important part, of San Fermín, are the bullfights. Yes, if you so desire, not only will be able to run with bulls in Pamplona, you will also be able to see them brutally killed. It’s a cultural tradition that the locals get very into and that you will undoubtedly regret seeing, but when in Rome, right? For a far more entertaining experience you might try heading to the bull arena to watch the bull runs (if you’re not participating) and then hilariously see unsuspecting tourists get mowed by angry calfs with corks in their horns. Are you a backpacker and or someone that doesn’t want to spend a lot of money and or someone that wants to save a lot of money so there’s more of it to spend on sangria? We’ve got you covered. And last but not least, we’ll confusingly end this post with the link you probably should have read first. 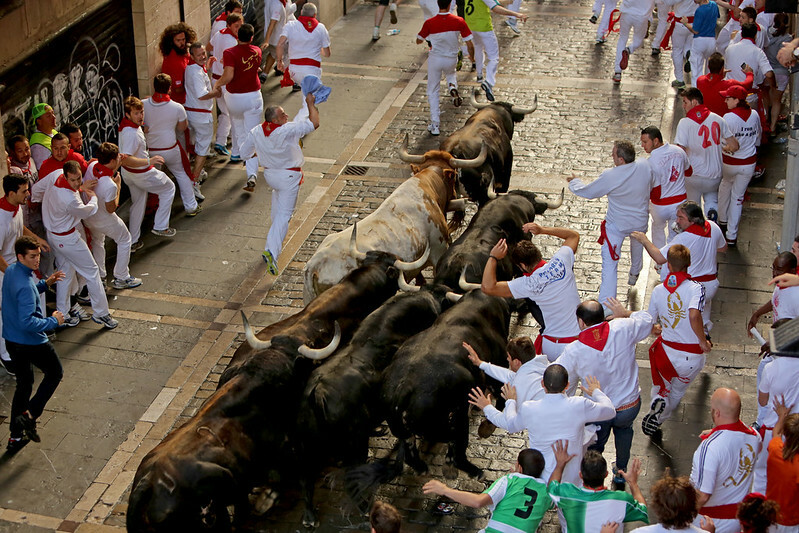 Running with the bulls in Pamplona is one of those bucket list things that everyone feels they should try once. Like climbing Mt. Everest or binge watching House of Cards it’s easier said then done and even the largest of Australians can have their doubts. But with a little common sense and proper running shoes, it’s not as dangerous as many would lead you to believe and the feeling afterwards of having successfully ran with the bulls is a fantastic one – far more rewarding than what you will feel the next day after drinking bota loads of Don Simon sangria.3 More likely than not you will come away knowing you could have done better and already planning your next run.